PERPETUAL Help started its bid for a fourth straight title with a four-set win over Jose Rizal University as the 90th NCAA women's volleyball tournament got under way on Wednesday at the MOA Arena in Pasay City. Rookies Ma. Lourdes Clemente, a 6-foot-2 recruit from Bulacan, scored 20 with 16 on kills as the Lady Altas won, 22-25, 25-18, 25-20, 25-19. 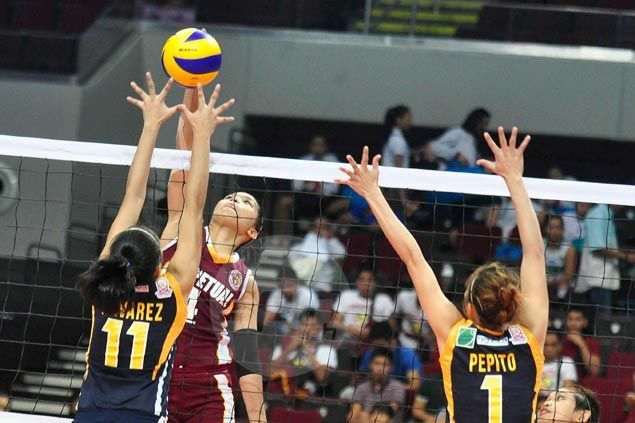 Cindy Imbo, from Cagayan de Oro, debuted with a bang for Perpetual Help, coming up with 12 hits. Arellano University, last year's runner-up, also started its campaign on a bright note as it scored a 25-12, 25-20, 25-22 victory over Mapua. CJ Rosario, younger sister of UAAP and D-League basketball standout Troy Rosario, fired a match-high 19 and lean but mean Danna Henson scattered points 16 for Arellano. Perpetual Help coach Sammy Acaylar said Clemente and Imbo have done well to filling the void left by former NCAA MVPs Honey Royse Tubino and Norie Jane Diaz, who have graduated. “We will need them to play consistently well for us to have a chance of repeating as champions,” said Acaylar. College of St. Benilde smashed Letran, 25-9, 25-19, 25-13.